In April 2016, the British government refused entry and shelter to 3,000 unaccompanied refugee children. Hearing this devastating news, Nicola Davies, who had already been left devastated by the story of refugee children being turned away from schools because there were no chairs for them, wrote a poem which was published in The Guardian, and the #3000 chairs project was born: drawing 3000 empty chairs, ready to welcome those children (you can see the gallery of drawings here or on Twitter) . The Day War Came (Walker Books) was born out of this campaign. And what a powerful book it is. Told from a child’s perspective, the book opens with familiar every day scenes of family and school life, until a sudden explosion destroys her school. This signifies the arrival of war and the little girl soon realises she has lost everything and, alone, she must make the long journey in search of a safer place. 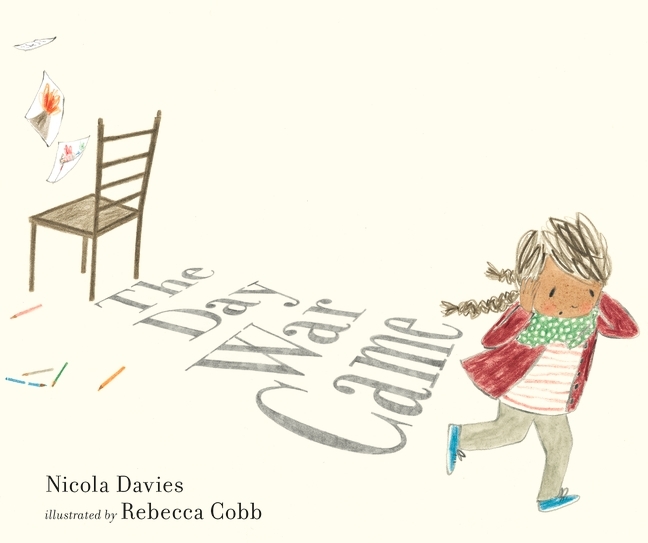 Nicola Davies’ sparse text emulates a child’s thoughts perfectly while Rebecca Cobb’s style has a childlike quality which allows her to portray shocking, heartbreaking scenes in a subtle, non-threatening way. It portrays the truth without sensationalism, because it shows the real human cost of the crisis, with a children’s voice reaching out directly to other children. This makes the book all the more heartbreaking, but also all the more important. Explaining the refugee crisis in words and images that children can understand, when they are so often being exposed to biased imagery and information from the media, is a powerful way to develop empathy and understanding. Hi Rebecca, many thanks for agreeing to answer a few questions on your work for The Day War Came, and welcome back to Library Mice (you can check out Rebecca’s Fabulous Five here)! Firstly, could you tell us a little bit more about how you got to illustrate this book, and what your thoughts when you first read the text? I was approached to illustrate The Day War Came because I had been one of the illustrators who had a drawn a chair for the social media campaign #3000 chairs, after Nicola’s powerful poem had been published on the Guardian newspaper website. It was written as her response to the news that MPs had voted against giving sanctuary to 3000 unaccompanied child refugees and after she had heard a story about a little girl refugee who was not allowed into a school because she was told there was no spare chair for her. 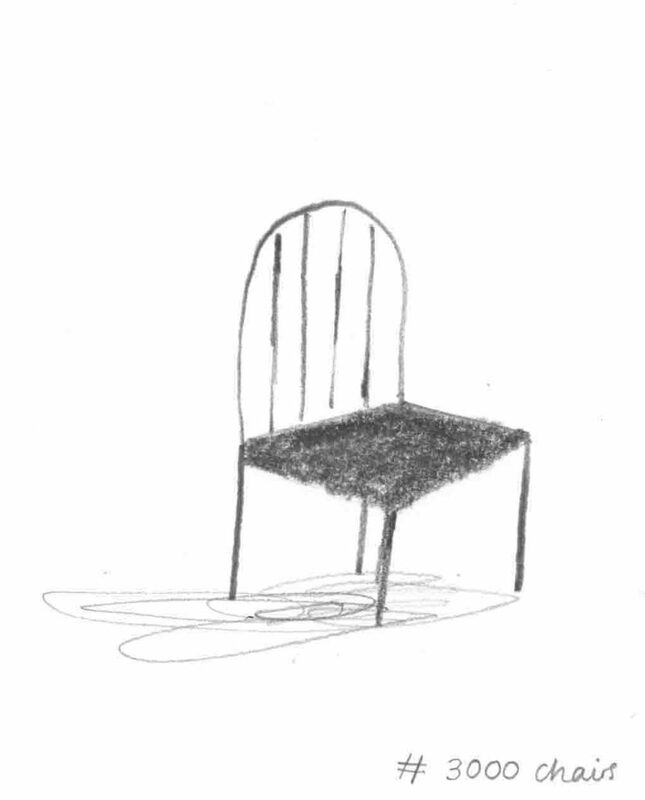 Nicola started the campaign with the illustrators Jackie Morris and Petr Horáček, encouraging people to join in and draw a chair as a symbol of solidarity with all the children who were completely alone and with nowhere to go . The words in the poem are so poignant and I was incredibly moved by it at the time. When I read it again sometime later as a picture book text, it felt even more powerful to me because I began visualising it as a picture book in my head. The little girl started to feel very real and I could picture the awful scenes of desolation around her and it overwhelmed me. What I loved about it though, was Nicola’s message of hope at the end and how it is a young child, as is so often true in life, who reminds us about the power of kindness and empathy. How did you decide on the setting, and the urban landscapes? Did you feel you needed to ‘fix’ it in a familiar place, making it historically potent, or did you want it to feel universal (Personally, I think you have achieve both!)? I did a lot of research for this book because even though I didn’t want to be specific about the locations, I wanted it to feel real and relevant. Nicola hasn’t named anywhere in the story but I had an idea in my head of where it might be set. I tried to give a sense of the places without making it obviously anywhere in particular because I liked the idea that it could feel universal. I would imagine the fifth spread, where the little girl realises she has lost everything and everyone, may have been challenging to work on, because of the subject. Both text and artwork say little and yet say everything. What was your process for this particular spread? This was a very emotional book to work on and I cried almost continuously throughout the entire project (perhaps intensified by the fact that I was pregnant at the time! ), but the text on this spread is so heartbreaking that it was definitely one of the most distressing to draw. Before I drew it I looked at a lot of photographs and documentaries showing war torn locations and bomb damaged streets. The things that stood out to me visually were the dark shapes of the windows, which gave an instant impression of the state of a building, and the immense amount of dust that coated everything in the same lack of colour. Earlier in the book I had used the orange flowers on the windowsill and the drawings of fiery volcanoes in the classroom to break up the skyline outside and hint at the flames which were to come and which we see among the buildings in this spread. I tried to imagine what the little girl would be doing when she returned to her home to find that it had been destroyed and I have drawn her desperately digging and searching through the rubble. You use full-spread illustrations almost throughout, and all of your illustrations, apart from the spread with the four frames, cross the gutter, giving a bigger sense of space but also of movement. Can you tell use a bit more about this choice of page design? The book begins with the little girl at home and in school and the illustrations on these pages are smaller and more contained because here she is inside, in a safe, familiar environment. The design changes from three-quarter pages to full double spreads when war explodes across the page. In the exterior scenes I wanted to use the full spreads to emphasise how exposed and alone the little girl had become and to show her getting smaller and smaller and more lost in the landscape. When she reaches the town and the school near the end of the book, the illustrations become panels or three-quarter pages again to show the contained secure environments, except that this time she is on the outside of them and is not allowed in. 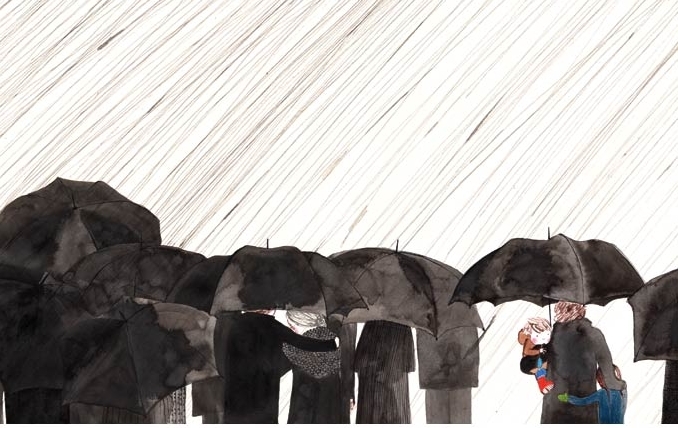 I feel there is a similarity to Missing Mummy in some of the spreads, in the way you use colour: the child is a spot of colour in the midst of darkness. Could you tell us a little bit more about that stylistic choice? How I use colour and the lack of it has always been important to me in my work and the colour palette for this book was the first thing I decided on. The idea of the cream used throughout came from looking at photos of the dust in urban bomb sites that seemed to obliterate the colour from everything. The brighter colours that I used came from news website images of refugee children, whose clothes in bright pinks and reds stood out against their desolate surroundings. I dressed the little girl in the book in these colours but chose to tone it to a very deep, almost blood-red. I love drawing in graphite pencil and it felt appropriate for the darkness in this book, like when the war arrives and a lot of shadowy pencil engulfs the pages. I used grey to show how war had followed the little girl and she is separated from the colourful houses and school classroom by grey walls, windows and doors because she is not welcome. The penultimate spread where the boy brings her a chair is almost like the opposite of the war arriving – the light from the open doorway floods into the room pushing back the shadows. Finally, can you tell us a little more about your forthcoming projects? I am working on a new picture book of my own at the moment, which is very exciting and quite daunting because it is the first time that I have written my own text since before I was expecting our first daughter over 4 years ago, but I am really enjoying it! I am really looking forward to finding out more about it nearer the time. Thank you so much for popping in, Rebecca. The Day War Came is out now, and you can buy a copy here. £1 from each book sold will go directly to support refugees via Help Refugees. 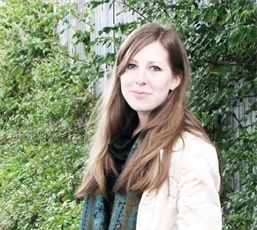 You can find out more about Rebecca Cobb and her artwork on her website , Twitter and Instagram. Nicola Davies on her website and Twitter.